All-everything linebacker Myles Jack is good at a lot of things, but he wants to be a better pass rusher. “I feel like things have slowed down,” he said. “I understand the angles, what I need to do in certain situations more with a year under my belt. Watching film this offseason, I understand more what I need to do. Hopefully it’s going to transpire this year. That’s really what I’m working on, to get a sack this year. One at least. Didn’t you sneak one sack in at the end of UCLA’s last season? But Myles, you were credited with one in the Sun Bowl. There it is on the box score: In the third quarter, on 2nd-and-12 at the UCLA 30-yard line, you sacked Mark Leal for eight yards. UCLA is breaking out its black “L.A. 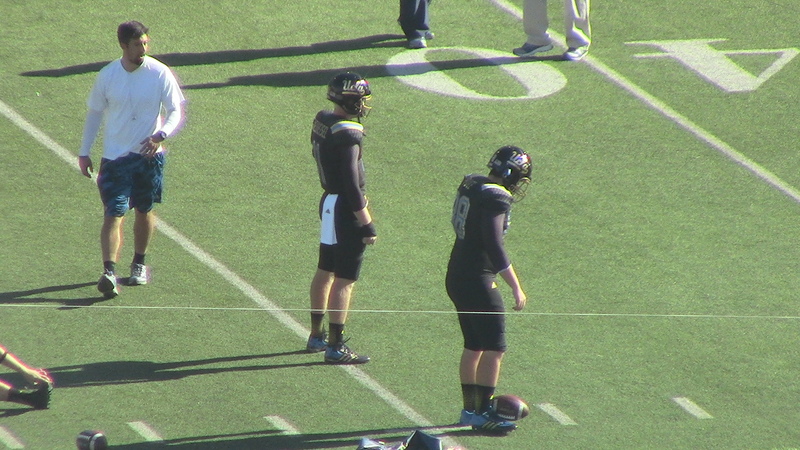 Midnight” alternates for the Sun Bowl, which likely makes most of the Bruins very happy. — Two former Bruins have fond memories of the 2005 Sun Bowl. — Jill Painter’s column on UCLA’s good behavior in El Paso. After UCLA’s win over USC on Nov. 30, head coach Jim Mora seized the moment. During a live postgame interview, he attempted to rope star quarterback Brett Hundley into committing to another year in college. It didn’t work — Hundley demurred on his NFL draft decision — but a month later, Mora remained optimistic heading into a Sun Bowl matchup against Virginia Tech.